As the world collectively muddles through 2012, it is has become increasingly apparent that we still don’t get it. Even after the collapse of 2008 and the completely fabricated and bogus ‘recovery’ that the lapdog presscorps still insists is ongoing, plus the various financial and economic ‘accidents’ that have happened along the way since, such as MFGlobal and PFGBest, plus the annexing of entire countries by the banking syndicate (Greece and Italy for starters), we still don’t get it. We are Rome. Obsessed with bread and circuses such as government handout programs and the Olympics and NASCAR, we’ve taken all that is abhorred by productive societies and made a center stage spectacle of it. Many readers and clients have commented to me that this is the strangest recession they’ve ever seen and they are right. America is hurtling in multiple directions simultaneously, at least from a socioeconomic perspective. In the same country where you have families living in cars and tent cities because of job losses, foreclosures, and other manifestations of a system gone awry, you’ve got areas where people are living the good life and spending money like there is no tomorrow. Much of it is borrowed, but that is of little significance to a generation that has been schooled and brainwashed into believing that debt doesn’t matter. Utopia is available for easy monthly payments. Paying back the loans is never really an issue or even something to be contemplated. If the government can do it so can we, right? We still don’t get it. We’re not alone in our near complete lack of understanding either. Europe, the poster child for greed and avarice, is further along in the game. Their currency has, for all intents and purposes, collapsed. As one country after another succumbs to consequences of its misunderstanding, the global banking syndicate stands ready with open arms to offer the bailout money in exchange for what amounts to indentured servitude. On a global scale, we are returning to Feudalism, and anyone who actually takes the time to do a little research will quickly conclude that Feudalism and the concept of the American circumstance as was envisioned by our founding fathers are incompatible. And the Feudalism is becoming built into the American psyche at younger and younger ages. The biggest crisis in this country right now in my opinion is the student loan crisis and nobody is talking about it. Making monthly payments has become a part of the formative years for most of our young people these days and if you think that is an accident, I’ve got some great oceanfront property in South Dakota that I’ll sell very cheap. Kids learn their habits from their parents and as a group we’ve set a terrible example. Hey parents, knock it off. Start living responsibly and within your means. Model wise financial behavior for your kids so they don’t end up in debt up to their eyeballs like you. You’re doing your kids a huge disservice. And if you think you’re going to be loaded enough to care for them their entire lives for the most part you are grossly mistaken. We still don’t get it. Sure Bernanke went on television and ensured us that all is well and that our kids owing over a trillion bucks to banks is quite all right even though beyond waiting tables there are precious few opportunities for many of them. And we know how accurate Ben was on the housing and mortgage mess. About the only thing he’s been right about has been the ‘jobless recovery’ he promised back in 2009. Still think he’s incompetent? I contend he knows exactly what he’s doing as do the rest that actually set global financial and economic policy. The Congress is nothing more than a conduit for carrying out the policy directives of the global banking syndicate. You don’t believe me? What about Hank Paulson going around threatening Representatives with martial law in America if the TARP bailout wasn’t passed? Sadly, America will fall just as Europe is falling. In many ways we’ve already fallen. Our sovereignty has been ceded to a banking cartel that creates its bingo chips from nothing, charges us to use them, and requires us to expend land, labor, capital, and scarce resources in order to make our monthly payments as a nation. Yet we sleep, totally unaware of the pillaging of the past 100 years. There is not a better example of the frog and the hot water analogy made so popular by those who have attempted to wake people up from this fatal slumber. We still don’t get it. An appeals court in the US has already ruled that clients in these types of situations have no recourse; that the actions of Jon Corzine and his good buddies on Wall Street are not only acceptable, they’re legal as well. And the outrage? Nonexistent. Given the fact that the average 55 year old has roughly $26,000 saved for retirement, a billion dollars makes up the retirement accounts of over 38,400 such individuals. And there is no outrage. Then there was another failure, this time ‘only’ $220 million disappears. That failure barely generated any attention whatsoever from the media and negligible outrage outside the circle of folks who really pay attention to such matters. Let’s take this a step further. Just in 2008 alone, we had the Fannie/Freddie mess, AIG, Lehman, Wamu, Wachovia, Bear Stearns and several other notable failures. To date there has not been a single arrest made, yet Bernie Madoff and John Sanford went down for kiddie-sized Ponzi schemes by comparison while the real felons continue to do business as usual, even stooping to rubbing our faces in it much in the way Jamie Dimon smirked his way through JP Morgan’s PR stunt when he went on ‘Meet the Press’ and talked about how the bank would still make a pile of money despite its ‘mistake’ that cost untold billions. These are bank robberies perpetrated by bankers. They make Butch Cassidy and John Dillinger look like amateur petty thieves. Pure and simple. There is a clear blueprint right here for stealing every single fiat dollar from every single American. And when you think of the nearly 1,000 trillion in notional value of cancerous OTC derivatives, which is enough to wipe out every IRA and pension in this country roughly 120 times. We can all remember back in the days of the cold war hearing about how both the US and USSR had enough nukes to wipe out the globe several dozen times. We’re dealing with this identical situation with derivatives. They aren’t even weapons of mass financial destruction; they’re weapons of total financial and economic disintegration. They’re global game changers and wealth redistributors that stretch across numerous areas of financial impact. And another reminder, this doesn’t stem from incompetence, but rather from the darkest parts of the human soul; those given over to the idea that the world is not enough. To call these people megalomaniacs would be a compliment. 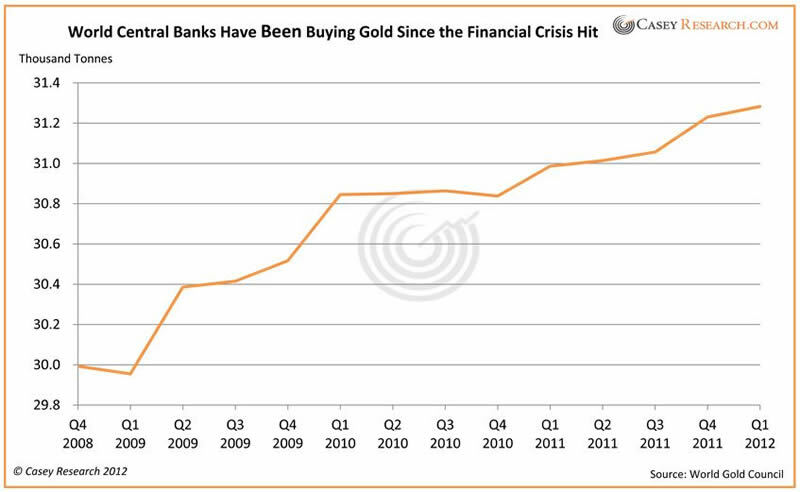 If this resonates with the reader then it should become readily apparent why the banking syndicate is waging an all-out war on precious metals. They cannot be controlled in the long run, are not easily confiscated, and unlike the paper FRN, are real money and an honest measure. An honest measure to today’s banker is like sunlight to a vampire. Jimmy Stewart is clearly dead. Today’s bankers are little more than casino operators and loan sharks. But the funny thing is that while the bankers wage a public relations war on precious metals and call them barbaric relics, they themselves are accumulating them like crazy. Again, are we dealing with incompetence or psychopathic behavior? I got into quite a bit of trouble with many readers several months ago when I called the Eurozone crisis a series of financial and economic coups. Now it has become clear that is precisely what they were and are. They’re takeovers. Not in the traditional sense, which are generally military in style, although we’ve seen a raft of those in the Middle East lately, but rather these are economic and financial takeovers. Allow me the latitude of an example. Let’s say Person A purchases a home from Person B and pays cash for the home. Putting aside the lack of allodial title in the US, we can assume that Person A now owns the property. However, over time, the ability of Person A to continue on its current financial and economic course is hindered by the fact that Person A’s five children all live at home and for lack of a better term, mooch off their parents. The situation deteriorates over time to the point where Person A now needs a loan or a bailout of sorts to keep things going in the right direction. In steps Bank C, who is willing to give a massive loan even though it knows Person A will never be able to evict its five mooches, nor significantly change its financial picture. Yet Bank C doesn’t really care because its loans are made from money which is created out of thin air. So it writes the loan, even though common sense dictates otherwise, and Person A signs on and now there is a lien on the house (mortgage). Person A is now an indentured servant to the bank. Six months later, the economic and financial situation hasn’t changed because no meaningful reforms have been made (remember, the entitlement situation is a mentality and a moral issue) and so Person A goes back to Bank C for another ‘bailout’. Now there is a second mortgage on the home and another lien and so forth. The end result of this scenario is that Person A ends up dedicating more and more of his productive energies and labor towards paying off the bailouts. In America we call this situation prosperity because the party can go on, but thinking people call this indentured servitude. I call it a takeover by the banks. They know full well that the Eurozone situation is not fixable. They know that meaningful reforms will be met with strikes, riots, and a general lack of economic momentum because, after all, the entitlement mentality is fully ingrained in the population. Yet the syndicate makes the loans anyway. Why? There is zero risk to the syndicate because it creates its ‘money’ from nothing. If the countries don’t pay, however, there are steep penalties. And even if they do pay, the fruits of the labor go right back to the syndicate. Heads the syndicate wins, tails the Eurozone loses. This is an identical replica of the situation that now faces America. The Treasury is broke, yet the fed is more than happy to buy bonds. Why? Is the fed that concerned with the welfare of the American people? Is the fed really interested in clipping coupons on its plethora of Treasury bills, notes, and bonds? Or is it more about power and control? Again, the fed creates the money it lends to the people (with the government acting as a conduit) from nothing. However, We the People have to expend scarce land, labor, and capital in order to repay all this debt that the government has assumed on our behalf. Reversing the transaction, the government again acts as a conduit. The various new taxes that have now been deemed ‘legal’ by the supreme court (an institution that ignores its mandates does not deserve proper noun status) are a way for the fed to be repaid with the government collecting the payment as ‘taxes’ and ‘penalties’. Distilling this, what is really happening is that more and more of our productive capacity is going to need to be dedicated to paying off the bankers. Just like Europe. You can certainly bet that when the next banking crisis hits that our government, which is nothing more than a collection agency for the bankers, will be more than happy to commit We the People to another generation of indentured servitude to the bankers. Just like Europe. When the Euro is ‘officially’ pronounced dead, the countdown clock on the USDollar will begin and the next domino will fall.